It is important to understand when they should be used and how to implement them. 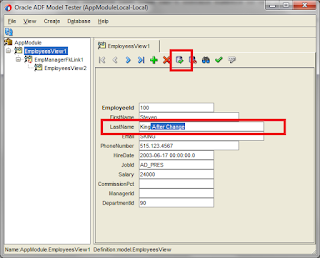 The attribute level should be used if some business rule applies just to it, for instance last name can't contain numbers or the phone number is mandatory. 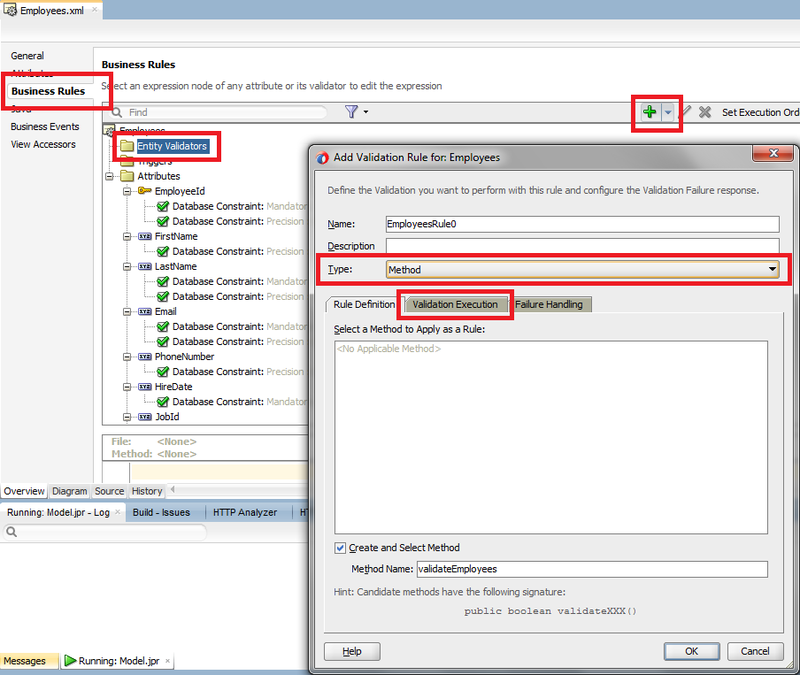 It is run for the attribute that is marked dirty in each of the entities, with an assumption that there is no other condition in the Groove implemented. On the entity level usually you should check for entity cross-attributes rules. For example is a person is foreigner, the passport number is required. 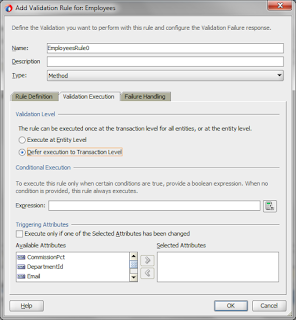 It is run for each entity marked as dirty in the transaction, you can exclude some entities by setting a condition in Groove or by setting attributes that should be changed in order to fire validation. Because it is not needed to check for passport number if the foreigner flag attribute hasn't changed its value. Transaction level is on the top of the list. It is run once for all of the entities in the collection, that are marked as dirty. The wizard to create one is not so straight forward. 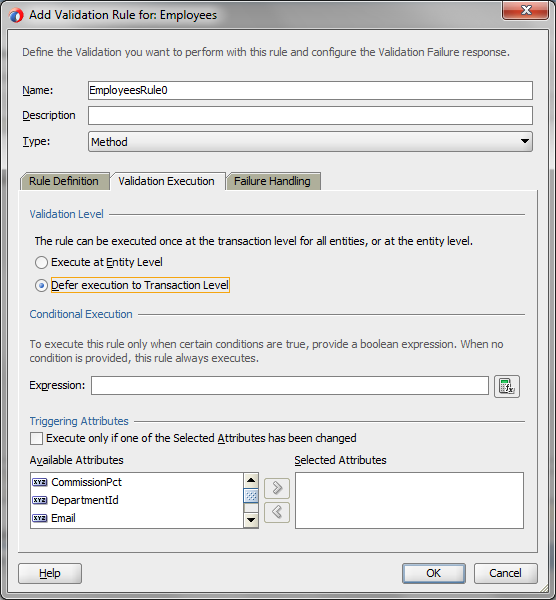 First you need to start entity level validator, change it to Method like it's usually done for entity validators. 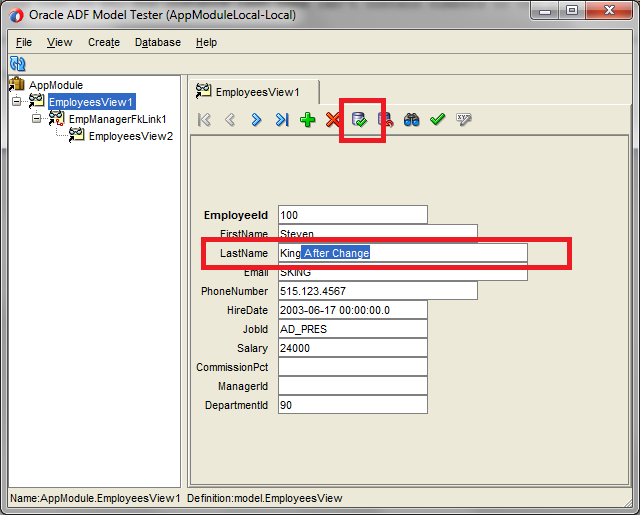 But after that you need to go to the second tab and change validation level radio button. 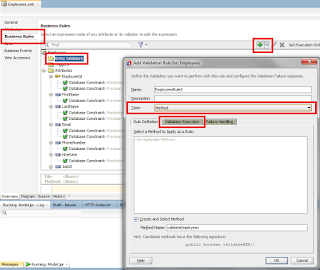 If you check previous tab then, the signature of the validation method has been changed. For the test purposes I'm not putting the error message, there is no such need. Please ignore the warning popup after clicking OK. The EntityImpl class is created. 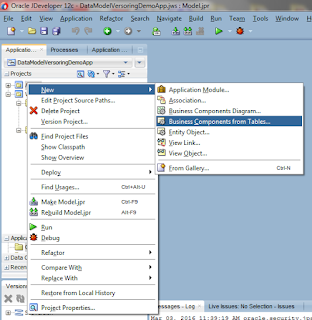 I've put few lines of logging there and I've run the application module tester. It is not a good practice, but if you want to run the validation on whole collection, you can of course do it. By calling ((JboValidationContext)ctxList.get(0)).getSource()) you'll get EntityImpl class. On it you can call getDBTransaction().getRootApplicationModule() to find the application module instance (the root one, as the method name suggests), and then findViewObject() there.